When you’re on the hunt for a new pair of shoes, you have to be picky. While it’s important to find a shoe that’s comfy and wearable, you also want to be on the lookout for something that has the “it” factor. Enter the cap-toe ballet flat, this season’s new must-have shoe! Odds are you already have a closet full of ballet flats. While that’s fine, isn’t it time for something new? With its toe dipped in colors like fuchsia, tangerine and bright green, the cap-toe will get you in the spring spirit in no time! Not only are they oh-so-charming and complement everything, but they also evoke a happy-go-lucky feel. For a fun twist on the classic ballet flat, try the cap-toe! From budget-friendly to splurge-worthy, here are six cap-toe ballet flats that are calling for you! 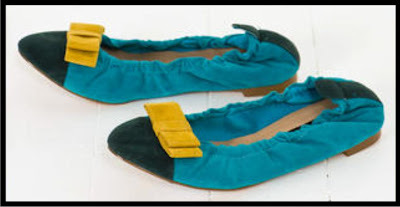 Every girl needs a pair of stand-out ballet flats that are a little bit quirky, a little bit eclectic. That said, this pair from Francesca’s is perfect! Available in the most coveted shade of turquoise and topped with a chartreuse-yellow bow, what more could you ask for? For a cap-toe ballet flat that is cute and brimming with personality, I recommend this playful pair from ASOS. Decked in black and white stripes with a pink tip, these cap-toes are just what you need to liven up your look! Spring is all about bold pops of color, color-blocking…and more COLOR! As it just so happens, this totally affordable pair of ballet flats by Simply Vera-Vera Wang fulfills both of these qualities. The color combination consisting of gray and neon yellow is unexpected and will surely add panache to any ensemble. Wear them with a little black dress or white skinny leg jeans for maximum perfection. I know I’m not the only one dreaming of a pair of quilted Chanel ballet flats. Until I can actually afford them, however, these ballet flats by Vince Camuto will have to do. For under $100, they are such a steal! Covered in white quilted leather and finished off with a black cap-toe, they are quintessential for any end-of-the-semester events. This pair of cap-toe ballerinas by Bloch fulfills my three C’s criteria: comfy, casual and chic. They’re casual enough to run errands in, yet totally chic when paired with black pants and a white blazer. Not to mention that they come in the most to-die-for shade of lavender (coral and pewter are also available). With a cute black bow and cap-toe, these are the crème de le crème! First off, you can never go wrong with Kate Spade. Second, coral is the ultimate springtime hue. Third, they’re made from cork and have summer-lovin’ written all over them! If you’re only going to splurge on one cap-toe ballet flat this season, then make it these – you won’t regret it! 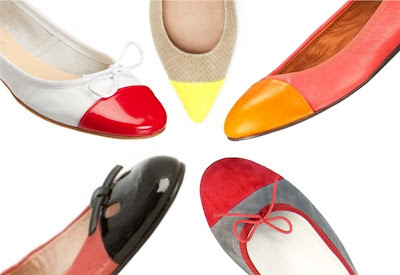 Tap your toes and get ready to make a statement with one (or all of these) cap-toe ballet flats! There aren't words to describe how much I adore those shoes!!!! Those are all women's classic ballet flats looking beautiful. Those are comfortable for wearing.